...a Severe Thunderstorm Warning Remains In Effect Until 1030 Pm Cdt For Central Coke And Southwestern Nolan Counties... At 1017 Pm Cdt, A Severe Thunderstorm Was Located Over Sanco, Or Near Robert Lee, Moving East At 30 Mph. Hazard...60 Mph Wind Gusts And Quarter Size Hail. Source...radar Indicated. ...Read More. ...a Severe Thunderstorm Warning Remains In Effect Until 1100 Pm Cdt For Central Erath And North Central Comanche Counties... At 1017 Pm Cdt, A Severe Thunderstorm Was Located Near Dublin, Moving Northeast At 30 Mph. Hazard...60 Mph Wind Gusts And Quarter Size Hail. Source...radar Indicated. ...Read More. ...a Severe Thunderstorm Warning Remains In Effect Until 1115 Pm Cdt For Eastern Tarrant And Dallas Counties... At 1014 Pm Cdt, A Severe Thunderstorm Was Located Over Irving, Moving East At 20 Mph. The Strongest Winds With This Storm Are Just South Of Dfw Airport. Hazard...65 Mph Wind Gusts And Penny Size Hail. ...Read More. ...a Severe Thunderstorm Warning Remains In Effect Until 1045 Pm Cdt For North Central Pecos...eastern Ward...crane And Western Upton Counties... At 1002 Pm Cdt, A Severe Thunderstorm Was Located 12 Miles Southeast Of Grandfalls, Or 22 Miles Southwest Of Crane, Moving East At 30 Mph. Hazard...two Inch Hail And 60 Mph Wind Gusts. ...Read More. The National Weather Service In Midland Has Issued A * Flash Flood Warning For... North Central Pecos County In Southwestern Texas... Glasscock County In Western Texas... Southern Ector County In Western Texas... East Central Reeves County In Southwestern Texas... ...Read More. The National Weather Service In Midland Has Issued A * Flash Flood Warning For... Eastern Ector County In Western Texas... Southeastern Andrews County In Western Texas... * Until 1115 Pm Cdt. * At 816 Pm Cdt, Doppler Radar Indicated Thunderstorms Producing ...Read More. ...the National Weather Service In Fort Worth Has Issued A Flood Warning For The Following Areas In Texas... White Rock Creek At Greenville Avenue Affecting Dallas County The National Weather Service In Fort Worth Has Issued A * Flood Warning For White Rock Creek At Greenville Avenue. ...Read More. PALESTINE – A Palestine man accused of robbing a convenience store where he bound two women and set one on fire was indicted on Wednesday of this past week by an Anderson County Grand Jury. Given the facts of the case, Mitchell indicated the charges of aggravated robbery and arson were the most appropriate charges as they carried the heaviest penalty. Under the law, she explained, attempted murder is considered a second degree felony which is punishable by term of between two and 20 years in TDCJ. Thompson is currently being held in the Anderson County Jail on bonds totaling $4 million. As previously reported, the Palestine Police Department received a call at approximately 10 a.m. on Thursday, Feb. 21 regarding the robbery-at-gunpoint of two females inside of the Pitt Stop gas station, located at 1221 Link St.
At the time, Community Liaison for the Palestine Police Department Michele Herbert-Reyes stated the suspect – later identified as Thompson – entered the convenience and demanded all of the money from store’s cash register. 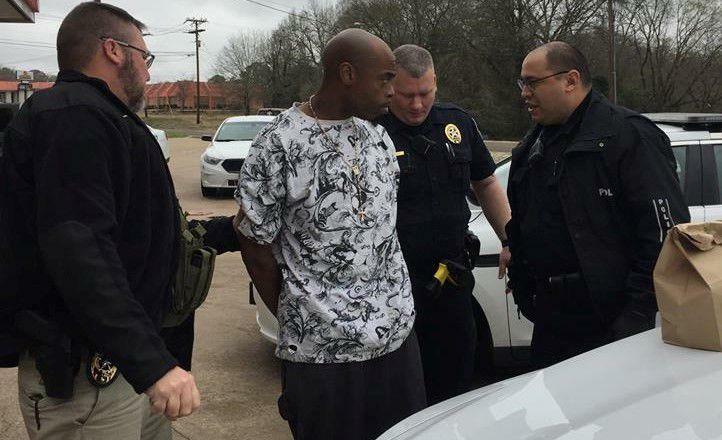 The community liaison further stated Thompson demanded the two females – a clerk and a customer – sit on the floor, where he bound them with duct tape. Video surveillance, Herbert-Reyes explained, showed Thompson douse the two females with lighter fluid. He then set the customer – identified as Della Witt-Denizeri – on fire. After taking approximately $800from the register, Thompson fled the scene and drove north on Hwy. 155 in a white Chevy vehicle. Later that same afternoon – at approximately 5 p.m. – Thompson was apprehended at JJ’s Fast Stop, located at 1200 E. Palestine Ave. The store customer – Witt-Denizeri – suffered burns to her head, face and neck. Initially, she was transported to Palestine Regional Medical Center and then to the burn center at Parkland Memorial Hospital in Dallas. She has since returned home while she continues to recover from her injuries.